I heard of the ‘Slovanská epopej’, the Slav Epic of Alfons Mucha not before I was in Prague in June 2014. Of course, I knew of Mucha already from his well-known and still loved Art Nouveau motives. 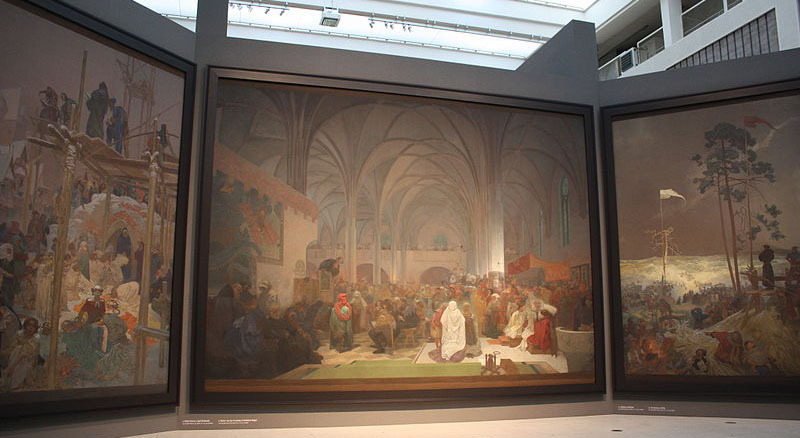 However, in Prague, his Slav Epic is praised as his ‘real’ work. I had three reasons to see Mucha’s ‘real’ work: first, my family name, Kalab, is said to be Hungarian, and I saw it often in Slovakia; second, my mother, being of German descent, was born in the Czech Republic; and third, Mucha’s Slav Epic reaches back into prehistory, to be specific, into the prehistory of Slavs. I felt I had to take all the time for it that I could spare before returning to Vienna. With the support of the City of Prague, the City Gallery Prague presents Mucha’s twenty huge paintings of his Slav Epic in a suiting hall on the ground floor at Veletržní Palace, the Trade Fair Palace. As the official comment in the accompanying booklet to the exhibition repeatedly explains, Mucha did not shrink back to alter historical facts to fit to his artistic intent and to humanist ideas of his time. Regarding this limitation, I nevertheless cannot deny him respect. Not only for his great work of art in the days of his time, but also for attempting to develop a vision to span his peoples past, presence and future. In the last painting of the series, Apotheosis 'Slavs for Humanity! ', he brings together, past, present and future. One can like or dislike the style and the notions of Mucha’s time that obviously infused his views. His Epic glorifies neither battles nor war, but peace and pacification. Long before I was born, Mucha captured in his particular way a view at which I arrived only hundred years later. Prehistory was present in history, as Mucha depicted it, and still is present today. Only by being individually and collectively aware and conscious of the presence of the very long past, may humanity hope to constructively shape a humanitarian future. Mucha points out, that each people has its responsibility and share in it. Only two of the twenty paintings of Mucha’s Slav Epic treat prehistoric themes, but sixteen deal with historical themes. The last two in the series can be interpreted as conclusions from his considerations of prehistory and history for the present and future, as he may have drawn them one hundred years ago. If only for the number of historical scenes I could present Mucha's work in the section ‘history’ on my site. Yet I place it in the section ‘prehistory’, to appreciate his approach, which begins consciously in prehistory. He draws lines from history back into prehistory, or, if you wish so, from prehistory to history; such as the relationship between Germanic and Slavic peoples. So the Germanic god Thor and his wolves appear threatening on his second prehistoric scene, The celebration of Svantovit on Rügen. In the third scene, The Introduction of the Slavonic liturgy, Mucha portrays the beginning of cultural independence of Slavs from Teutons. Although both peoples were already Christianized, Slavs could not celebrate their Christian faith in their own language. Only in the 9th century, under the protection of the prelates of Rome and Byzanz, they received this right. And only in the eight painting, in the scene After the Battle of Grunwald on July 15, 1410, again 600 years later, the artist mentions a military-political victory of a Slavic people over the knights of the Teutonic Order. So the three paintings span a millennium or more. Obviously Mucha found that current relations between peoples can date back to the prehistory and that their development and healing can take centuries and millennia. So Mucha thematises the relations between peoples spanning centuries and relativizes cultural changes that may occur during such time. Such a view, which takes into account developments that can take centuries and millennia, seems to me necessary to draw meaningful conclusions from what we know today about the prehistory. Therefore I present Mucha's work in the section 'Prehistory', as a possible example of how to deal with current knowledge about long periods. Thereby I do not forget that he changed historical facts for his artistic purposes. These pages on my site pay homage not only to Alfons Mucha the painter, but also to Alfons Mucha the philosopher and visionary. And they are a homage to the City of Prague, who makes his painted philosophy accessible to many. What Prague considers his main work is in my eyes of great importance and value today; past any artistic style, ethnic and temporal limitation. To me, Mucha’s vision is a vision of a real past and a possible future humanity, an expression of hope, be it set and expressed in the subjectivity and limitation of his time and place. Slavs are ‘only’ one huge group of peoples, subject to forces like all other peoples, under which man grew over a span of hundreds of thousands of years. What to former generations may have appeared like a utopian vision, may today have been become a global necessity. 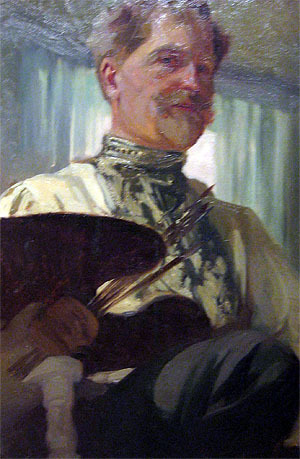 The presented order of the paintings differs, as well as from the order in which Mucha painted them and offered them to the city of Prague, as well as from the order in the official brochure. The sequence in which Mucha offered them says something about his inner development during his work. As far as possible I present the paintings ranked by the timeline of the events and persons that they portray. The first two paintings refer to moments in prehistory. The painting Mount Athos refers to an undetermined point in history; pilgrims visit the monasteries on the mountain until today. The last two paintings refer to futuristic or utopian moments. With my little camera I could not make usable pictures of the paintings. The images I use I found in the public domain at Wikipedia and via the website of Radio Prague; they cannot be more than a modest impression of Mucha's work. The exhibition is organized by the City Gallery Prague with the support of the City of Prague. The exhibition takes place at Veletržní palác / Trade Fair Palace, Dukelských hrdinů 47, Praha 7, 170 00. Open daily except Mondays from 10:00 a.m. to 6:00 p.m.